Pastor William Patrick Cabell serves is the Pastor of the Multicultural Worship Center, located in Upper Marlboro, Maryland. 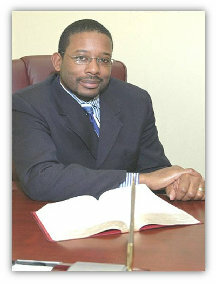 Pastor Cabell was born on July 11, 1962 in Washington, D.C. He is the third of four children born to William P. Cabell I and Shirley V. Cabell. Pastor Cabell completed his primary and secondary education in the District of Columbia Public School system. He graduated from H.D. Woodson Senior High School in 1980. Pastor Cabell attended the University of the District of Columbia, as well as the Washington Bible College in Lanham, Maryland. Pastor Cabell accepted Jesus Christ as his personal savior and was baptized at the early age of eleven at the Capitol View Baptist Church in Washington, D.C. Pastor Cabell was very active in Sunday School, Vacation Bible School, and many other church activities. In February 1990, Pastor Cabell and his family united with Glendale Baptist Church, in Washington, D.C. After exhibiting the hand of God on his life, Pastor Cabell became a very active servant in the work of the Lord. He was involved with the Men's Fellowship ministry, Mission's ministry, Watch Care ministry, and Visitation ministry as well as serving as a Boy Scout Troop Leader. On April 24, 1994, Pastor Cabell was elected a Deacon, and on January 3, 1996, he was called to preach the Gospel, and preached his initial sermon in January 1998. As a licensed Minister of the Gospel, Pastor Cabell served in all areas of the church's ministries, including Sunday School, Bible Institute, Young Adults, Evangelism, and Outreach ministries. On April 24, 1999, Pastor Cabell was ordained by the Glendale Baptist Church, under the leadership of Senior Pastor Anthony G. Maclin. On January 1, 2000, Pastor Cabell became the Overseer of the Glendale Baptist Church's Multicultural Worship Center. Pastor Cabell was installed as Pastor of the Multicultural Worship Center on January 9, 2005 at a "Consecration and Planting" service. Under the leadership of Pastor Cabell, the Multicultural Worship Center has become a thriving church that has grown in numbers from an original 22-member birthing team to more than 350 members. Pastor Cabell has developed and leads more than thirty ministries that help to equip and empower the saints for the work of ministry and for the edifying of the body of Christ. In the spring of 2008, God blessed the Multicultural Worship Center to acquire 6 acres of land in Upper Marlboro, Maryland, on which a magnificent worship complex for Christ will be erected. Pastor Cabell is providing the visionary leadership that will enable MWC to build a place of worship where the spirit and soul will be blessed and energized. Pastor Cabell plans to raise the funds necessary to complete the building project through a"Building the Vision" campaign which he launched in May 2008 and extends over a 3-year period. Pastor Cabell is married to the former Dena Yvette Harris of Washington, D.C. They are the proud parents of three beautiful children, Dia Shanice, William Patrick III, and Denia Katrina Cabell. Pastor Cabell was called by God and elected by a visionary to serve the people of the Multicultural Worship Center.